I have already memorized (bad idea, BTW) that a loop can occur if FD < RD. Could you please tell me how a loop could occur assuming FD < RD and we ignore the feasibility condition. 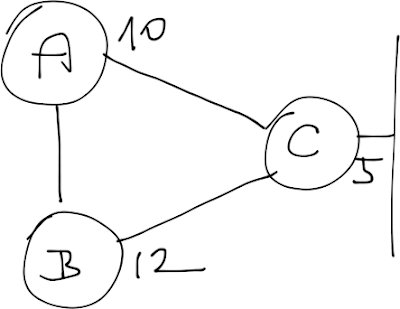 I’ll use a simple three-router network (see the following diagram) to illustrate why EIGRP cannot figure out whether an alternate more expensive path could lead to a loop or not. Based on the link costs (I’m using scalar metrics for simplicity), C advertises the LAN IP prefix with cost=5. 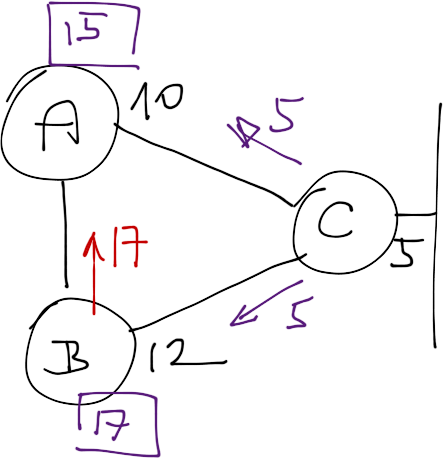 B adds its own incoming link cost (12), reporting the total cost of 17 to A (RD = 17). A receives a similar update from C and adds its incoming cost (10). The total cost of getting from A to LAN prefix behind C is 15 (FD = 15). However, A does not know whether B has an alternate path to C or whether it reports the path through A back to A. Assuming EIGRP split horizon is disabled on B (which might be required for NBMA networks like DMVPN), B could increase the total cost to C and report the increased cost back to A. We know that’s not the case because we can see the whole topology of the network. A doesn’t have that much visibility (that’s the main difference between EIGRP and OSPF); the only safe course of action it can take is not to use alternate paths with RD > FD. So this is usually relevant when Spit-Horizon is disabled? I always have a difficult time coming up with a situation where Split-Horizon is enabled but a loop might still occur if not for the Feasibility Condition. The simple rule is once a new route passes through a router with a particular metric, the looped route via the same router can NEVER have a metric lower than the intial metric...this is the crux of FC. The FC check prevents the feasible successor from being immediately installed in the routing table, and forces the query/response game (using the last known good metric as the measuring stick). If you increase the diameter just a bit (like adding D between A and B), it's easier to see a race condition of advertisements, that IF they were installed in the routing table immediately, temporary loops would occur (until re-reconvergence). Even if split horizon is enabled, when all links are healthy, A and B do exchange their best path (directly to C), and if both links to C go down (silly, I know, since C owns the subnet), and A and B ignored the feasibily check, they would temporarily route traffic to C's LAN IP until they poison-reversed, etc. If we add a few routers in the mix, it gets messier during convergence, which is why there is a feasibility check. My question has always been (and this article reminded me), why FD must be less than RD, and not less than OR equal to. 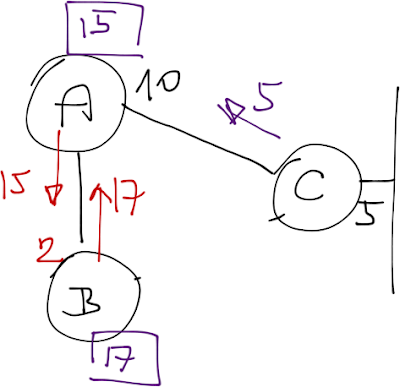 If RD is higher, we know loops can occur, but I cannot come up with a situation where if AD=RD, there is a loop. but if we use variance there may loop isn't it? No. EIGRP would never use a path if the next hop is not a feasible successor. Guys. Can anyone help me to understand why MTU is not used to calculate metric by EIGRP although it is avilable to switch on. I have realised in one of my practise that MTU didnt play any role on metric calculation regardless to k1=1,k2=1, k3=1, k4=1, k5=1. If it is not used for what purpose does it exist? I dont mention default k values. Thanks beforehand…. MTU is a tie-breaker: if more than "maximum-paths" EIGRP paths have the same metric then MTU is used to select the best N (at least that was how it worked the last time I checked). There might be a post explaining that behavior somewhere on this web site (don't remember whether I wrote it or not). "Based on the link costs (I’m using scalar metrics for simplicity), C advertises the LAN IP prefix with cost=5. B adds its own incoming link cost (12), reporting the total cost of 17 to A (RD = 17)." Shouldn't it be (FD=17) ?